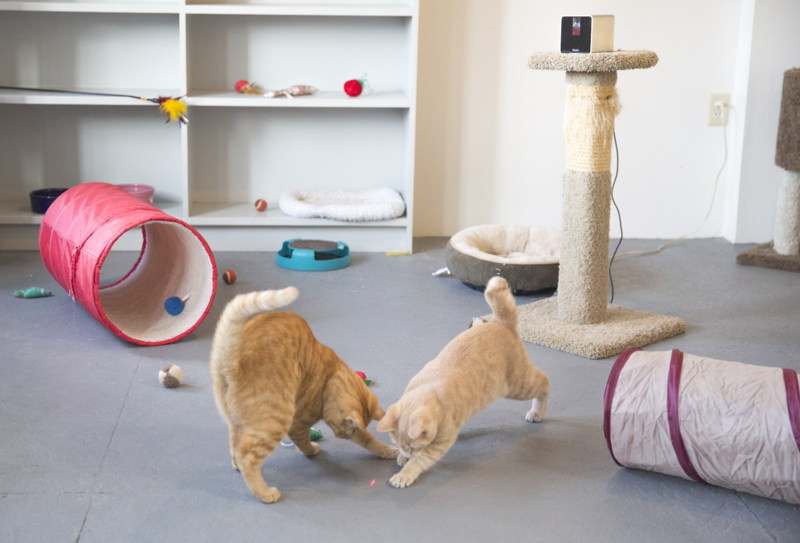 Users can control the Petcube laser pointer to interact with shelter cats like these little tabbies. I've always dreamed of having a way to see what my cat, Alice, is up to during the day while at work, or during the rare times I'm out of town. Sure, you could set up a webcam or use a home security system to check on furry loved ones holding down the fort, but a new product recently hit the market that's made for this specific purpose. Petcube is a gadget that lets you see and interact with your pets from an iOS or Android smartphone. The device was in part made possible thanks to a Kickstarter campaign, and it's recently rolled out for purchase by non-backers of the campaign, which raised more than $250,000 back in fall 2013. It retails for $199 and can be purchased online from the company's site, and through Amazon, BestBuy and a few other retailers. To promote the product and the noble cause of adopting a pet from a shelter, Petcubes have been distributed to several shelters and rescues across the U.S., including our own Spokane Humane Society. The cube there went online early this week, and lets users who download the Petcube app (find the Android version here; and the iOS version here) watch and interact with cats in the communal cat adoption room "Catlantis" at the shelter, says SHS outreach and volunteer coordinator Jenna Carroll. While the Petcube is programmed to allow users to talk to their feline and canine friends through a microphone, and to control a laser pointer for playtime, the SHS cube doesn't let you talk to its cats (because, well: trolls. It would be weird for visitors and staff, too. ), however you can play with them. The 4-inch cube sits up on a shelf high above the room offering a wide-angled view of the space. 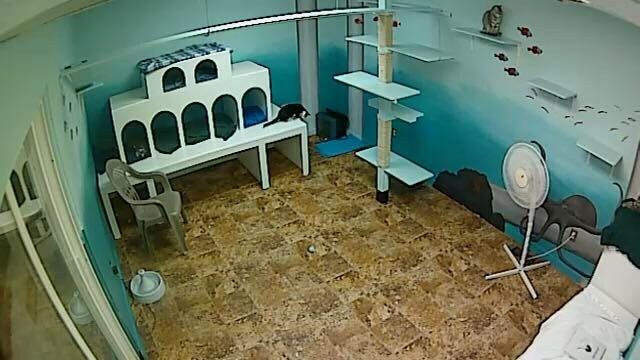 The Petcube at SHS lets the public interact with the cats in "Catlantis," the shelter's communal cat room, which is often filled with playful kittens this time of year. When I logged on to test it out this afternoon, several kittens (Note: Carroll says the shelter is at capacity right meow and has lots of adoptable cats and kittens looking for homes) were seen wandering around, but none of them seemed to notice or were interested in the laser that you control with your finger via touchscreen. It looked to be a busy day at the shelter, with many visitors coming in and out of the room to visit the kittens, so I assume they were overstimulated, and thus not really in the mood for play. It was still fun to watch them, and this feature alone makes the app useful from a pet owner's perspective. Spokane Humane Society's Petcube is online during regular shelter hours (Mon-Fri, 11 am-6 pm; Sat-Sun, 11 am-5 pm). Since the publicly-accessible Petcube at the shelter was launched, Carroll says she's tracked 90-100 sessions each day in the past week. Only one user can access the Petcube at a time, but Carroll says when someone else steps in the queue the current user gets 30 seconds before they're booted to let the next person online. "I'm super excited about the possibility of telling people about it who can't leave their homes otherwise — like people in hospitals, and even people all over the world," she says. On a separate but related note, Carroll says because the shelter is so full of cats and kittens looking for homes, SHS is running out of litter boxes. Those interested in helping out can drop off litter boxes at the shelter, or order from its Amazon wish list (see "Shelter Supplies" on the left) to have them shipped directly there.